St. Luke’s has a longstanding tradition of providing gifts during the holidays for families and individuals who find themselves in need. We do this by working with several organizations with whom we have an especially warm relationship. Our dear friend, the late Rosanne Morey, had championed these initiatives for many years. The project, known as the Christ Child Project, was renamed in 2010 to the Rosanne Morey Christ Child Project in her honor. • Sponsor a family for Christmas – The Youth Consultation Service Therapeutic Nursery in East Orange, NJ provides highly structured support to children with special needs between the ages of 2 1/2 and 5. St. Luke’s sponsors approximately 10 families of YCS children. We receive a list of specific items the family would like for the holidays and make the necessary purchases. If you would like to fulfill these holiday wishes, please contact Lilli Delmar. Feel free to partner with a fellow parishioner to sponsor a family jointly. Lilli will provide you with the ages and gender of each family member and their needs/wishes for the holidays. • Purchase a Gift for an Adult Man – Apostle’s House in Newark provides transitional housing to adult men. 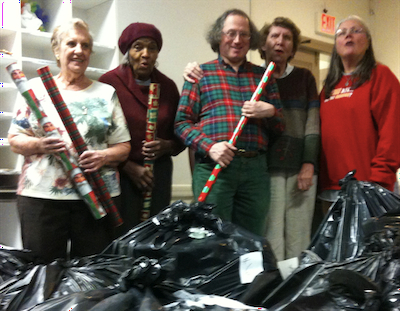 The St. Luke’s Choir has supported these men with gifts of toiletries, socks and sweatshirts for many years. Gift requests for the men will be on the Giving Tree at Coffee hour. • Make a Cash Donation – Cash donations can be made by noting “Rosanne Morey Christ Child Project” on the red and white envelopes in your pews or by selecting an envelope from The Giving Tree at coffee hour. Cash donations will be used to fill in any gift requests which remain open after all gifts have been received. If you have any questions about donating money to the Rosanne Morey Christ Child Project, please contact Catherine Murray.